Geralt, preparing for a hunt. Image: Screenshot via YouTube channel mashed. Geralt and Jack aren’t incredibly alike, but this mashup really works. 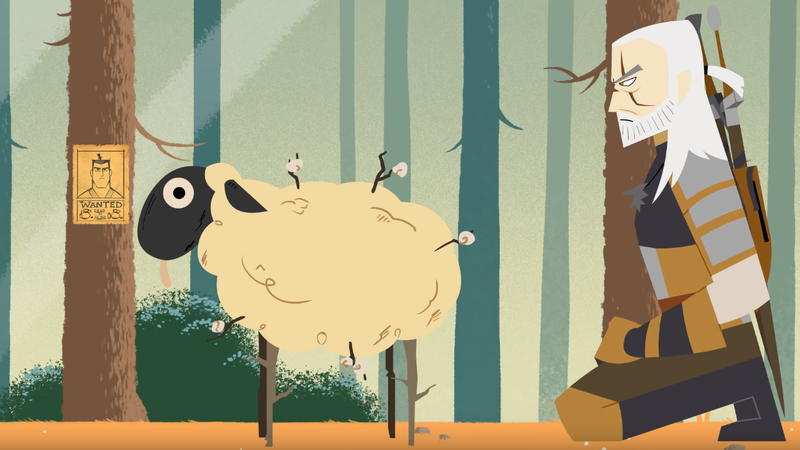 Directed by Jason Dewey and Liam KcKeown, with animation by Liam McKeown, “SAMURAI WITCHER: Geralt vs. The Griffin” is a combination of the violent drama of The Witcher and the deliberate artistry of Genddy Tartakovsky. In it, the Witcher Geralt prepares for, and fights, a nasty Griffin in a manner similar to the way players do so in an early quest in The Witcher 3: Wild Hunt. And, boy, does this combination pop. The careful, calm preparations for the hunt—the use of bait and chemical concoctions—fits perfectly with the slow precision of Samurai Jack’s house style, and the swordplay is brilliant. Be warned, it gets a bit, uh, bloody, but I suppose that’s Geralt’s way. I know that we already have an upcoming Witcher live-action TV series, but... could we just do this instead? I would much like more of this, please. Watch it below.